The pictures are typical of the 1968-1972 units. 1964-1967 units have an extra connector by the blue headlights power output wire--it's a purple wire--this is the output for the front parking lights ONLY. 1964-1967 models have front parking lights which turn OFF when the headlights are turned ON. To change this, so the front parking lights stay ON with the headlamps (like 1968+ models), you can carefully remove the terminal connector corresponding with the purple wire and relocate it in the "unused slot" position and use a 1968+ headlight switch. The headlight switch receives power input from two different sources. The red wire provides the feed -just- for headlights themselves. Protection for the headlight output is provided by a thermal circuit breaker inside the switch the itself. Pulling the switch out to the second position links the red wire to the blue output wire. The blue wire sends power down to the floor mounted dimmer switch which directs power to either the high beam or low beam circuits in the headlights. The orange wire provides power for everything but the headlights themselves. The orange wire originates from the fuse box's Tail Light Fuse. When the switch is pulled out to the first or the second position it links the orange power wire to the brown wire (output power for the tail lights, parking and marker lights). 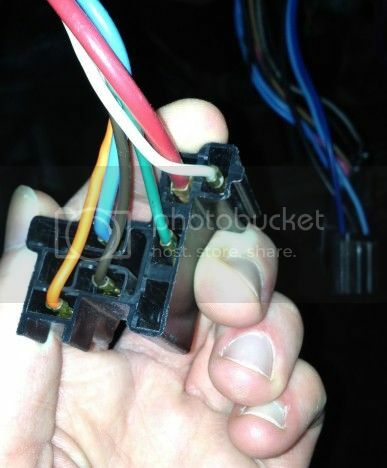 The orange wire is also linked to the rheostat (dash light dimmer). 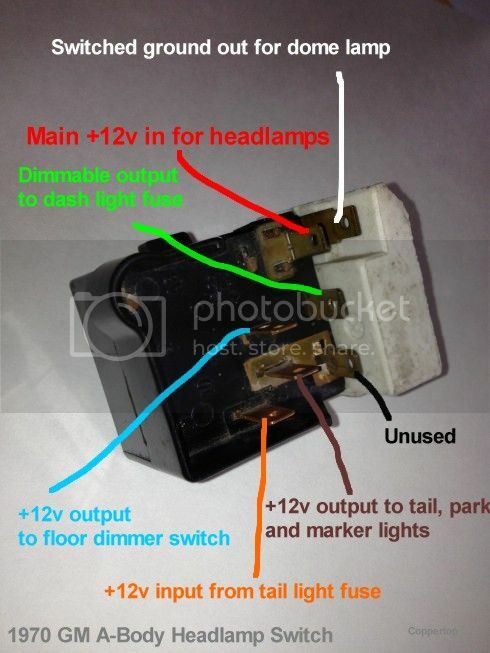 Depending on how far the headlight knob is rotated, the voltage output is varied and sent out the green wire. The green wire is sent back down to the fuse box where it is connected to the Instrument Lamps Fuse. This fuse protects the dash lights which tie into the gray wire leaving this fuse. Lastly, the white wire provides an additional ground connection to the dome/courtesy light circuit. By fully rotating the headlight switch (regardless if the switch is even on), a cam attached to rheostat wiper causes a contact to touch the frame of the switch. If the switch is attached to the dash properly with its ground strap in place, this ground is transferred to the white wire and thus the dome light/courtesy lights turn on. Last edited by Dean; Mar 11th, 18 at 9:09 PM. Thanks Joe, Good info there. Nice to have. 66 malibu wagon, 327, AC, pw. Now I have a trouble-shooting tree, my 68 chevelle headlights do not work but everything else is fine. Initially I was thinking Headlight switch, but now I'm gonna check out the floor dimmer switch which would explain why everything works but the headlights. Here is another pic of the wiring on top of the switch. The colors show up a bit better than the Joe's original. Thanks for the write-up, it saved me the price of a headlight switch. I made this - parking lights on when the head lights are on - change today on my 65. Joe's published information was straight forward but it took me three or four new switch installations into the panel before I finally got it right. Removing the old switch requires removing the knob/rod and pushing on the spring button to remove the knob/rod does not always work well. Removing the purple wire and its termination 'clip' from the female plug requires a very small thin blade to depress the retaining feature on this purple wire. Remember to bend the retaining feature back on the relocated purple wire and its termination 'clip' or it will not stay in the female plug... Taking the front left seat out allows better access to the underside of the instrument panel – however this is not my favorite pastime. Thanks to Joe for the good info. thanks for the information and pictures....will try the weekend. I have just re-assembled my dash and put the power to it. Everything is working fine, however, When I turn the headlight switch all the way to the left the dash lights go out, which I'm pretty sure that is supposed to happen. However, when I turn the switch back to the right to where you feel the click, so, maybe a quarter turn the dash lights don't come back on for a while (5 minutes) this only happens if I go all the way to the left. no matter where I turn the knob the lights won't come back on until it sits with the key off for just a few minutes. Turning the switch all the way to the left should normally turn on the dome light. If you click over to the right you should have a working dimmer switch for the dash lights. In this case it appears as if the dimmer part of the switch is either broken or requires cleaning of the contact surface where it rubs against the little coil which is part of the mechanical rheostat. In cars this old it's usually best to simply replace the switch which would also fix the problem. 65 Chevelle 2Dr. Post,Global West stage 3, Small Block, Small Journal 337cid. Howards roller cam .570/.570" lift 227/233 duration @ .050 LS112, Speed Pro forged pistons 10 to 1, Trick Flow 195,23 degree heads, Holly 750 Ultra, Edelbrock Performer RPM air gap. Just after I posted the reply I thought "I bet that all the way to the left is for the dome light" and you did state that, so thank you. The switch is a new switch. The dash lights should stay on and the dome light turns on when you turn it all the way to the left, correct ? The dimmer does work as the more I turn it to the right the dimmer the lights get until there is nothing . I think I have two issues, but possibly only one mode of the switch is broken causing both the lights to go out, then stay out only to work again in a few minutes. I should add that I don't have the rear harness in the car yet, so the dash light won't come on. I would think this should not matter though, correct ? Sorry, that should have said the dome light won't turn on. The dome light "override" (ability to turn on the dome with the headlight switch knob) works at all times, regardless of the dash lights/headlights being on. I'm not sure if I'm understanding your question(s). So the switch is new, but the dash lights are going off by themselves after a few minutes? There is no need to replace the switch to do the conversion for 64 - 67 Chevelle's. the only difference between a 64-67 switch and a 68 and later switch is the extra terminal for the purple wire on the 64 - 67 switch. Yes, take the purple out of it's current position and relocate it to the un used slot as marked in your original post. The 64 - 67 switch has the same un used terminal. Hence, No need for the new switch...Trust me, I've done it!